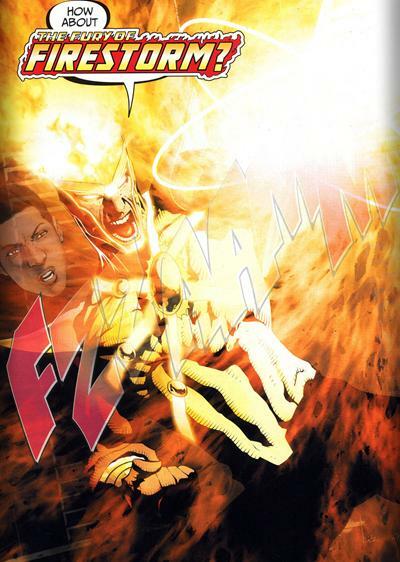 The black lantern firestorm; deathstorm, confronts the professor mentor to the original firestorm and absorbs him. Ronnie and Jason fuse together to form firestorm to stop the black lantern. Jason’s abusive father laments all his sons acheivments despite the abuse at his hands. Deathstorm absorbs him as well completing his own matrix. Deathstorm goes to New Mexico where he picks up the white lantern which has featured prominently since this series started. It’s the source of all life on earth apparently. DS corrupts the lantern which changes to black and now channels the voice of Nekron who wants DS to stop the resurrected twelve so that he will control the power of life. 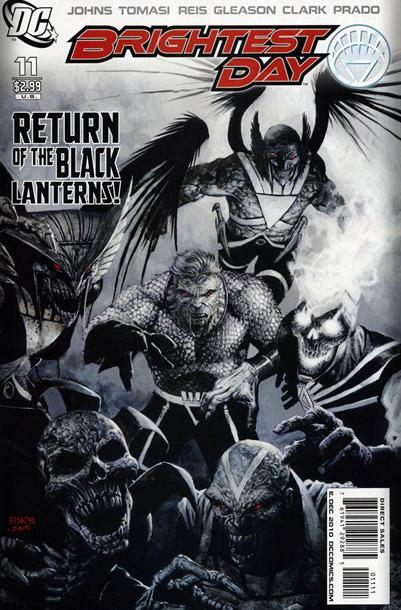 Deathstorm creates black lantern effigies of all the twelve resurrected heroes to serve his masters will. Elsewhere Manta, siren and her troops attack Aquaman and Jackson Hyde. Manta and Aquaman are evenly matched and both injured, luckily Manta gets tossed in front of a stopping trailer which give our escapees enough time to scramble away. In the trailer now leaving New Mexico Aquaman forces Jackson’s hand to touch the object from last issue and it opens revealing a map marked with their next location. Martian man hunter flies to mars where a whit lantern symbol is carved out in a fresh new forest on its surface. The art on this series still just marvels me….a bi-monthly book which has better art than much of the crap we pay more for each month? I don’t know which demon or god the writers made a deal with to get this done (cough….Nekron..cough) but the visuals are outstanding. This series also holds a consistency in this department that few books can compete with. Now for the story: It was very interesting with ties to continuity in many areas. The firestorm situation tied the two firestorm wielders Jason and Ronnie together by examining how similar they are and yet so different. Both are special given potential to wield the firestorm matrix, both are headstrong, both have father issues. 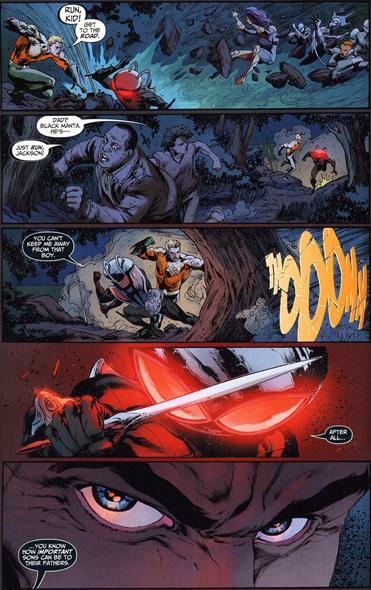 Their differences though, Jason is easily angered, smarter and more prone to flee than fight. Ronnie is calm but not too smart and would jump into action without thinking allot like Hal Jordan. All this is conveyed in the small bit of panel time that they get this issue. Deathstorm makes for a worthy adversary as well with all the firestorm power at his disposal and the professor’s mind now inside him. By joining with Jason’s dad he also gets a psychological one up on our duo since he has access to the most painful memories that Jason has. By joining with these two DS also makes himself hard to kill….since if he dies…in theory they die. How will Firestorm handle that? Aquaman and Manta enjoyed a great fight both Hate each other with a passion beyond reason. Manta cruel and cold jeers Aquaman about killing his son and the betrayal of the woman he loved while Aquaman need say nothing his eyes say nothing would give him more pleasure than to kill this man. Good times ahead for Black Manta the black supervillain who needs to get more props than most would give him. Aqualad and the mystery surrounding him continue to mount with the impending aqua war on the horizon. I’m still not convinced we need this entire story to unfold in one book; I would rather to get rid of the manhunter bit and get more of the “meat”. I would also have preferred to buy two books so I could have gotten more of the Aqulad story and the firestorm story…but hey I’m sure I’m in the minority. Both tales were cut short due to the uninteresting manhunter bit. I like John but c’mon!